Theater drapes and stage curtains are large pieces of cloth that are designed to mask backstage areas of a theater from spectators. They are designed for a variety of specific purposes and come in several types; many are made from black or other dark colored, light-absorbing material, and heavyweight velour is the current industry standard for these. Theater drapes represent a portion of any production's soft goods, a category which includes any cloth-based element of the stage or scenery (though not including cloth theater costumes or wardrobe). Proscenium stages use a greater variety of drapes than arena or thrust stages. 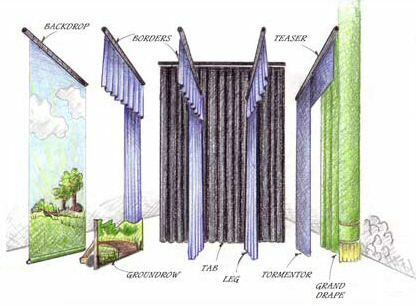 In proscenium theaters, drapes are typically suspended from battens that are controlled by a fly system (i.e., they are "flown", in theater terminology). When a drape is flown, the task of adjusting its height for best masking effect is simplified and, in the case of a drape that must be moved during a performance, this enables the drape to be quickly raised above the proscenium arch—thus positioning it out of view of spectators—or lowered to any arbitrary height above the stage, as required. Theatro Municipal do Rio de Janeiro, painting by Eliseu Visconti (1908). The front curtain, which is variously called a grand drape, act curtain, house curtain, house drape, main drape, main rag, or, in the UK, tabs, hangs downstage, just behind the proscenium arch. It is typically opened and closed during performances to reveal or conceal the stage and scenery from the audience. There are several types of front curtains, which may consist of a single section or two sections, of fabric that may be pleated or flat. Depending on the type, front curtains may travel horizontally or vertically. In the case of front curtains that travel vertically, some types gather near the top of the proscenium when opened, while others are raised into the fly space above the stage. Hard teasers and tormentors are flat, horizontal and vertical (respectively) pieces that are located just upstage of the grand drape. Together, one hard teaser and a pair of tormentors (one on each side of the stage) are frequently used to form a reduced-size "false proscenium" within the frame of the actual theater proscenium. Hard teasers and tormentors are typically covered with thin plywood, which in turn is covered with dark colored, light-absorbing material. The teaser is usually flown from a dedicated batten so that its height can be independently adjusted so as to optimize its masking of the flies (the fly system and its loads). In the UK this teaser is usually referred to as the House Header. In some productions, a show portal is used in place of a false proscenium. This is a decorative "frame" for the stage which also serves to mask backstage areas, just as a teaser and tormentors would. Legs are tall, narrow stage drapes that are used to mask the wings on either side of the stage. Borders, are wide, short draperies that span the width of the stage; these are used to mask lights and scenery that have been raised into the fly loft. Legs and borders are typically made from a heavy, light-absorbing material similar to that of other stage drapes. Typically, a set of two legs, one on each side of the stage, and one border, is used to form a complete masking "frame" around the stage. Several such sets of legs and borders are typically employed at varying distances upstage from the proscenium. Travelers are curtains onstage which can open (typically to the same width as the legs) and close (typically obscuring the entire Upstage, sometimes creating portals). Drapes that hang at the sides of the stage perpendicular to the proscenium opening to mask the wings are known as Tabs (outside of the UK), as shown in the drawing at the top of this page. In the UK (where Tabs refers to a different type of drape), these curtains have other names, often Up & Downers (as unlike most drapery that runs across stage, these run from upstage to downstage). A scrim, sometimes gauze, is a curtain made of an open-weave fabric that appears opaque when lit from the front, but transparent when a person or object behind the curtain is lit. A backdrop (or cloth) is a painted curtain that hangs in the back of the stage to indicate scenery. Before the advent of motion pictures, theaters would have 6-8 stock painted backdrops on canvas for use in live theatrical performances. Often these would include an urban scene, a nature or garden scene, and a domestic interior. Drops may be hung by various means. Often made of muslin which has been sized and painted, the top may be pressed between two pieces of lumber (a batten) and clamped to a pipe, with a pipe or chain through a hem pocket at the bottom giving it weight to prevent flapping. Some may be grommeted along the top and tied to the pipe with tie-line (usually drapery cord nowadays). A time-honored method of hanging a drop is the roll-drop, in which the bottom of the drop is attached to a round batten. The drop is rolled onto it from the back, and is deployed by rope rigged through blocks (pulleys) to be pulled from offstage to release the tension holding the batten up, thus unrolling it slowly until completely unfurled. There is also a form of drop used in Vaudeville days, which may still be seen in older theaters, called an olio. "Olio" means conglomeration, and these drops were most often roll-drops covered with advertisements from various sponsors, for the audience to view between shows. A cyclorama or cyc is a large curtain, often concave, at the back of the stage that can be lit to represent the sky or other backgrounds. Traditionally white or natural colored cloth, cycs now come in various colors of white, grey, light blue and the green or blue curtains used in Chroma key (greenscreen) work may also be called cycs. With projected scenery, cycs and scrims may be used as drops, by employing either front or rear projection. This was done in a general sense in the 1910s and 1920s by means of painted glass plates in front of lighting instruments, which made sculptured shadows on the cyc to indicate such images as a cityscape or a scary dungeon. (Focus was generalized in the early days; nowadays we have projectors with adjustable lenses.) Lighting instruments (generally ellipsoidals) may also be used to project scenic effects on cycs and scrims, by using gobos, also known as templates or patterns. With an ellipsoidal reflector, the light source is positioned at one focal point of the three-dimensional ellipse, then the pattern - cut metal or glass or other heat-resistant material - is positioned in reverse position so that the light escaping the instrument passes through the pattern first, then through the other focal point and the lenses, and is projected upon the cyc or scrim. ^ a b c Gillette, Michael (2000). Theatrical Design and Production (Fourth ed.). Mayfield Publishing Company. pp. 56–63. ISBN 0-7674-1191-9. ^ Holloway, John (2010). Illustrated Theatre Production Guide (Second ed.). Burlington, MA: Elsevier. p. 49. ISBN 978-0-240-81204-5. This page was last edited on 5 March 2019, at 13:10 (UTC).